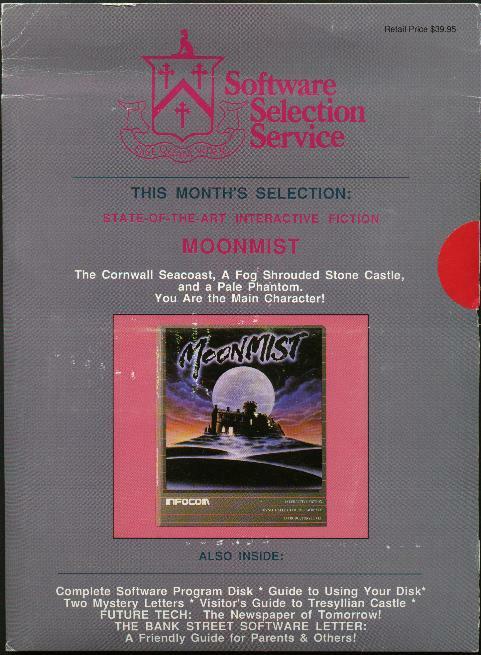 Here's an oddity, a special release of Moonmist by the Software Selection Service's "Software of the Month", an Apple II club that featured a variety of different software titles each month for I don't know how long. The folder is about the size of a folio package, pretty flimsy, and contains a standard Infocom-label disk, a loose browsie manual with the white tab still attached, reference card, and all of the props except for the iron-on (which isn't mentioned on the front of the folder). Anybody out there have a list of everything published by the SSS?